Teaching by "positive role models"
Reaching over 1000 people in the community and university, this newsletter promotes patient and community involvement in health professional education at UBC. Aboriginal Community as Teacher Summer Camps Register Now! Are you a UBC student in a health care discipline and want to be better prepared to work with Aboriginal patients/clients and communities? The Community as Teacher program is an award winning program that was developed from a need for better training of health care providers to work with Aboriginal patients and communities. 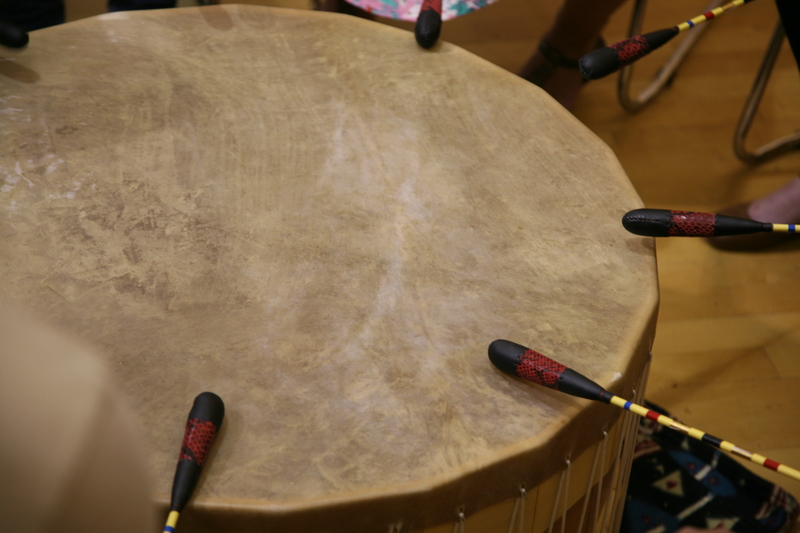 It is an opportunity for UBC students to learn alongside Aboriginal youth and families at summer camps put on by Fraser Valley Aboriginal Children and Family Services (Xyolhemeylh). The camps are held on the Chehalis Indian Reserve and neighboring communities and led by Elders, youth workers and cultural leaders. Over 3-4 days students learn about developing culturally appropriate relationships and experience many healthy, contemporary and traditional lifestyles of the Stó:lō people, including aspects of the medicine wheel (spiritual, mental, emotional, physical). Space is limited to 6 students per camp. To register you must be a current or incoming health professional student. A criminal record check is required. For more information or to register, email Chris Mill at christopher.mill@alumni.ubc.ca. 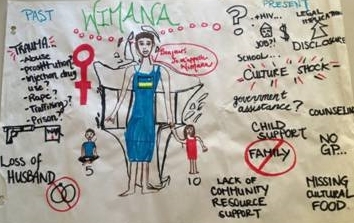 Photo: An interdisciplinary problem-based learning (PBL) group's illustration of a paper-based case used to teach many realities of living with HIV. How to teach about prevention and care regarding any transmissible chronic illness, particularly a life-threatening one… one that is still relatively new, quickly evolving and especially stigmatizing… then teach it across multiple health disciplines – at the same time, in a practical manner? This is what has been done since the 1990s, annually, at UBC through the College of Health Disciplines course offering IHHS 402 “HIV: Prevention and Care” – a six-credit, award-winning course. Medicine, nursing, pharmacy, dietetics, social work and dental hygiene all have students and practitioners in the course; experts in social determinants as well as in treating the illness present; panels exchange knowledge across the classroom; and most importantly, many HIV-positive persons not only deliver content and narrative, but are fully-participating members of interdisciplinary PBL groups of students and faculty, established on the first day and visiting different paper cases six times throughout a theoretical but realistic period of years. It’s an intense four-week, all-day-every-day course, including six clinical placements, but it gives a rare chance to learn many realities of living with HIV as well as how inter-disciplinary care teams work. Paul helped with planning and delivering this course for six years and has been privileged to be the faculty co-chair during the 2013 and 2014 iterations. Eighteen UBC students from medicine, social work, physical therapy, midwifery, pharmacy, dentistry, kinesiology, food and nutrition sciences will embark later this month on a transformative learning journey in First Nations communities across the province - part of an elective Interprofessional Health and Human Service (IHHS) course offered by the UBC College of Health Disciplines in partnership with the UBC Centre for Excellence in Indigenous Health and five First Nations communities across BC. The students enrolled in IHHS 408 will spend one-month living and learning in the communities of Skidegate (on Haida Gwaii), Esk'etemc (near Williams Lake), Mt. Currie (near Pemberton), Seabird Island (near Agassiz), or Cowichan (near Duncan). This unique four-week, 6-credit summer course offers students in the health disciplines the opportunity to learn, live, work, and play in a First Nations community in BC. Students learn the diversity of Indigenous worldviews on health, wellness, and medicine, and begin to develop an appreciation of how these perspectives can be integrated into health care practice and promotion with Indigenous peoples in a culturally respectful way. This immersive learning experience occurs within the context of local community health knowledges and teachings, allowing students to appreciate how values and cultures shape healing in a particular community. The course’s interprofessional focus encourages students to work together in a team environment and share discipline-specific knowledge, thus enhancing skill sets and providing an additional ‘lens’ through which to explore health and its determinants. IHHS 408 is an exciting learning experience that transforms students both personally and professionally. For more information and to apply for 2015 click here. For the past seven months 50 interprofessional groups of four students and a mentor (adult volunteers who are experts by experience with a chronic condition) have been meeting to learn about chronic disease management, health care roles, and patient-centered care. On Wednesday, April 23rd, over 300 students, faculty, mentors and guests turned out to share the learning, including an educator from the UK. Dr. Clare Price-Dowd who leads a training program for health care staff in the UK, was visiting the UBC Division of Health Care Communication on a scholarship to learn how to effectively involve patients in the education of health professionals. Groups presented their learning in the form of a "tweet" (140 character phrase) and poster board display designed as a 'conversation piece'. According to mentor, Fran Banks, "the room was bouncing with positive energy and I don't think the smiles could get any bigger." Students from 10 different health and human services programs participated, including Audiology student, Myron Huen who said, "I definitely learned a lot, and it was fun to meet all the other groups and learn about their experiences with the program. It was interesting to see that although we all had different mentors, a very similar theme ran through all of the poster boards!" To view all groups' tweets click here. Want to mentor in 2014-15? CIHR's Institute of Health Services and Policy Research (IHSPR) Policy Rounds are webinars that disseminate research results and foster knowledge exchange among researchers, health care policy and decision makers, and other stakeholders. IHSPR Policy Rounds showcase current research evidence on high priority topics and promote evidence-informed decision making. Anyone is welcome to participate! The next webinar will provide an overview of the Canadian landscape of pharmacare policy and will compare it with international policies – including: the United States, the United Kingdom, the Netherlands, Germany, Australia, and New Zealand. Research and discussions will span issues concerning access, system efficiency, financing and equity. Challenges facing policy makers in advancing this important issue will be addressed along with suggestions for next steps. Matthew Brougham, Vice-President, Products and Services, Canadian Agency for Drugs and Technologies in Health (CADTH). To view past webinars and register for upcoming webinars click here. 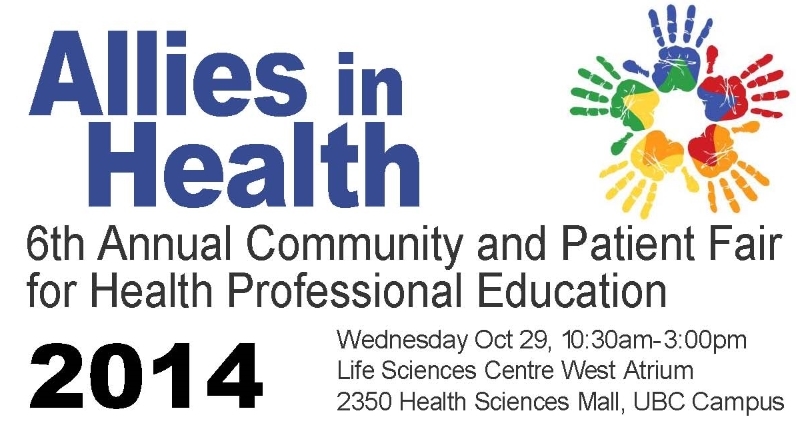 The 6th Annual Allies in Health Fair will be Wednesday, October 29th 2014 UBC Life Sciences Centre. The Community and Patient Fair is an annual, one-day interprofessional event that connects community-based organizations, patient support groups and individuals involved in these agencies with students and faculty at UBC. It is part of UBC’s Celebrate Learning Week. The Fair recognizes the unique expertise and role of people in the community in the education of health professionals and promotes meaningful partnerships between UBC and the communities it serves.